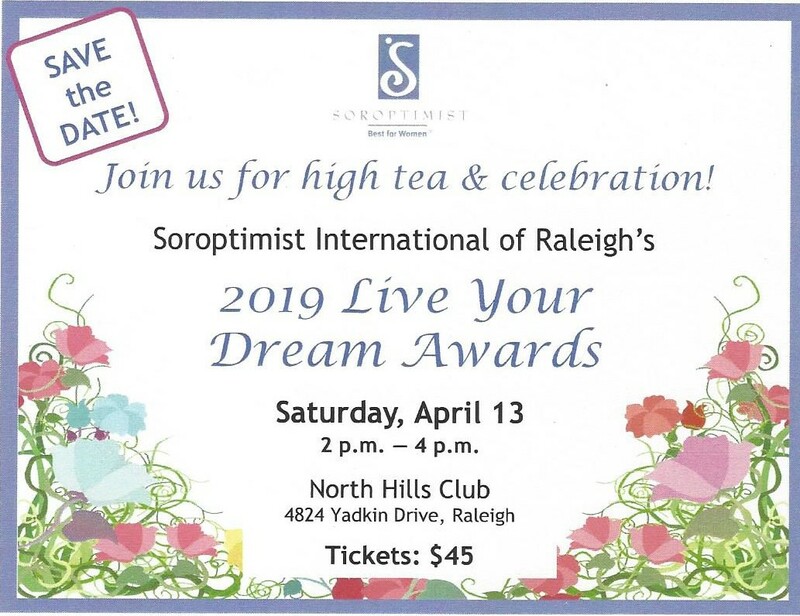 Soroptimist International of Raleigh participates in programs on the local level, depending on the specific needs of our community. Our signature project, operation of the Raleigh Boutique of Dress for Success Triangle, NC is intended to help women achieve economic independence. The boutique provides business appropriate clothing to women job seekers referred by 30 partnering organizations. A network of support and resources are provided through the Professional Women’s Group and Career Center. In support of out commitment to end violence against women, we focus on domestic violence, human trafficking and teen dating violence/abuse. Through our annual awards program we give monetary grants to the recipients of three awards in recognition of women striving to be their best. At a worldwide level, we work with Hope and Homes for Children in Project SIerra to provide a caring secure family home for children who are alone or at risk of abandonment while living in extreme poverty. The project location is Sierra Leone, West Africa. Our members are professional women with business, management or executive skills who have a heart for service. To accomplish our goals, each member takes an active role in fundraising and hands-on service projects, all as volunteers.